Vice President Yemi Osinbajo has counselled newly wedded couples to always imbibe the teachings and lessons of Almighty God in their marital life to enable them have peace and joyful married life. Speaking yesterday at the wedding reception of the in-law to President Muhammadu Buhari, Hamza Ahmed, at the Banquet Hall of the Presidential Villa in Abuja, Osinbajo advised the couple to always do things together and imbibe the spirit of togetherness. According to the News Agency of Nigeria (NAN), the Chief Imam of Abuja National Mosque, Prof Shehu Galadanchi, conducted the wedding Fatiha after a payment of N100, 000 as dowry by the representative of the groom. Prof Abdullah Abba. The wedding Fatiha was attended by the President; Senate President Bukola Saraki; National Security Adviser (NSA), Gen. Babagana Munguno, and Inspector General of Police (IGP), Ibrahim Idris, among others. 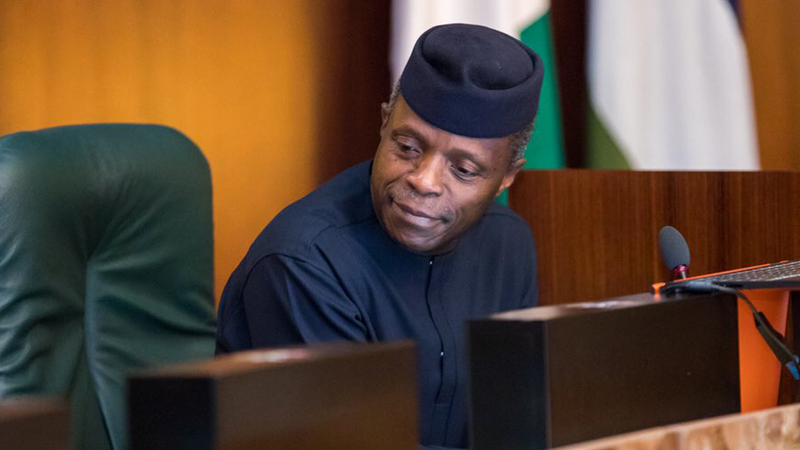 Osinbajo, who was the special guest of honour at the event, enjoined the couple to dedicate their life and time to ensure the success of the marriage. Also speaking, Governor Abiola Ajimobi of Oyo State called on the couple to tolerate each other and avoid negative tendencies that could lead to disagreement between them. Ajimobi also urged the couple to take their marriage an act of worship by providing the necessary support to each other. Representative of the bride and Managing Director of Federal Airport Authority (FAAN), Mr. Saleh Dunoma, prayed for God to always provide the means for the groom to take good care of the bride, saying from yesterday, the welfare and wellbeing of the bride became the sole responsibility of the groom. In his closing remark, the Secretary to the Government of the Federation (SGF), Mr. Boss Mustapha, urged the groom to take Osinbajo’s counsel seriously as the only way to attain successful married life. 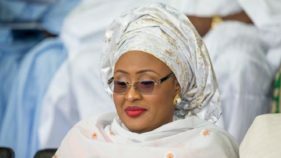 “Hamza, your marriage is beautiful, but on constant basis, I plead with you to always abide with God in your marriage, because He is the only one that can sustain that marriage,” he said. The SGF, therefore, thanked the invited guests and prayed to God to take everyone back to their various destinations safely. Dignitaries at the reception include Chief of Army Staff, Gen. Yusuf Buratai; Gombe State Governor, Hassan Dankwambo; former IGP Mohammed D. Abubakar; Acting Chairman of the Economic and Financial Crimes Commission (EFCC), Mr. Ibrahim Magu, among others.